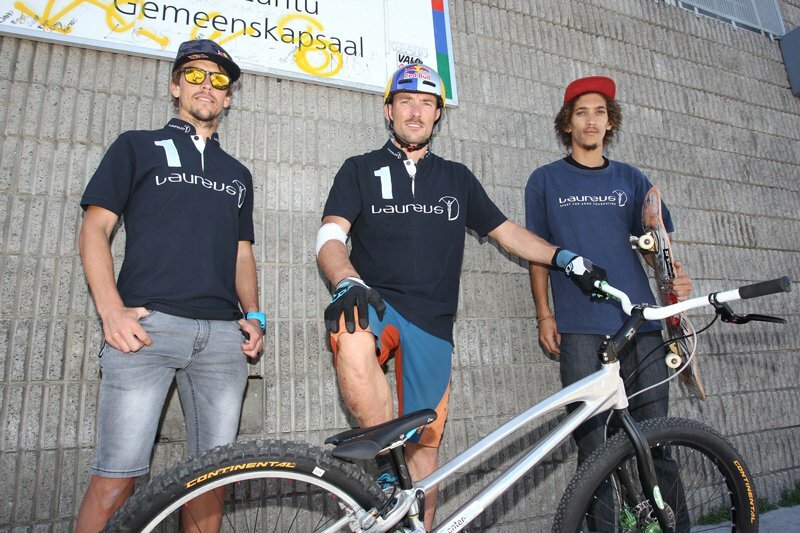 Laureus Ambassador and Belgian world champion bike trials cyclist, Kenny Belaey, showcased his skills to a group of young skaters at the Indigo Youth Movement project in Kleinvlei, Cape Town, earlier this week. Belaey then wowed the young crowd with a demonstration of some of the tricks and skills that have earned him the nickname “The Magician”, along with four Elite World Championships, six World Cup wins and three European titles. Belaey commented, “It is amazing to see the passion these kids have for skating. It’s the same passion and focus that I’ve had for biking for the last 23 years”. Disadvantaged kids in the Cape Flats area are exposed to substance abuse and gangsterism on a daily basis and the project has given them an avenue to use skateboarding to combat these negative influences. “The Indigo Youth Movement is a great example of Laureus using sport to help young people in disadvantaged communities. Kenny’s visit will definitely inspire these kids to keep focused on skating and the positive influence it has in their lives”, said fellow Laureus Ambassador Ryan Sandes, the South African trail runner and one of the world’s premier endurance athletes, who was on hand to host Kenny at the visit. Both Kenny Belaey and Ryan Sandes are part of an impressive list of current and former sportsmen and women around the world who support and promote the Laureus Sport for Good Foundation as Laureus Ambassadors. These Ambassadors volunteer their time to champion the work of the Sport for Good Foundation, whose mission is to use sport as the means to combat some of the world’s toughest social challenges facing young people today such as juvenile crime, gangs, HIV/AIDS, discrimination, social exclusion, lack of education, landmines awareness and health problems such as obesity. Since its inception in 2000, Laureus has raised over €60 million to improve the lives of millions of young people and currently supports more than 150 community sports projects in 34 countries. The Laureus Sport for Good Foundation South Africa currently supports 15 sports-based community initiatives nationwide and since its inception it has raised over R50 million for projects and programmes which have improved the lives of more than 80,000 young people.